What’s one of the best ways to install a floating shower bench seat? We take a look at Wedi’s Sanoasa bench seat in our video. It’s very easy to install and surprisingly strong for it’s size! Why do shower’s need a bench? Let’s answer the first question…shower benches provide a place to relax during or after showering. Also, they can serve as a spot to store shower accessories like soap, shampoo, razors, etc. But I’d only do that if the shower didn’t have a niche!! Shower benches come in a variety of styles and shapes. Standard benches can be framed and built with 2x4s. Then waterproofed with backer boards like Wedi, KERDI-BOARD, or cement board. Many showers now have linear drains. And linear drains can be hidden with a floating shower bench seat. Wedi’s Sanoasa shower bench seat is one of the best options because it’s easy to install. But it requires some planning. Our quick video shares why we like this floating shower bench and some quick installation tips. Would you rather have a floating shower bench seat or a stand shower bench? P.S. 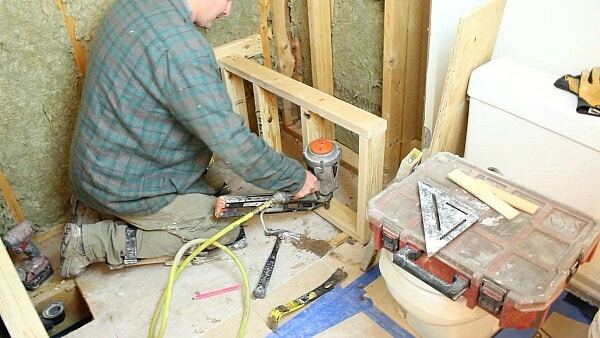 Our online store has a ton of supplies for homeowners doing a bathroom remodel. You’ll find wedi shower systems, KBRS shower pans, tiling tools, and more. Thanks for your always helpful videos. I would prefer a traditional shower bench as I would have more trust in its strength and not be worried about it collapsing from the weight of an older person sitting heavily on it, or plopping onto it and then using it as support to push them up to stand. The floating bench along with the linear drain is exactly what I am looking for and if it’s made by Wedi then you know that they have done the R&D to make sure that it’s strong and safe. Thank-you for introducing me to this. Hi Jeff. I have a floating shower bench love it…except when it comes time to clean the shower. You must clean the underside of the bench, corners and walls because “grunge” seems to thrive under there. This means getting down into awkward contortions to scrub the undersides and corners. That floating shower bench looks like a lot of trouble to install a less stable bench than the classic bench. I am very skeptical of its strength as opposed to traditional bench. The comment about cleaning seals the deal fo me; bad idea; no thanks. The last thing I need in my life is more nooks and crannies to clean! It depends on how the bench is installed. Wood blocking inside the stud walls is absolutely necessary and I wish Wedi would have that in their installation instructions. We’ll have a tutorial on this bench down the road and show how to make it solid. The bench can hold up to 500lbs, so a solid top could be put on top of it. That would make cleaning a lot easier and similar to a traditional bench. 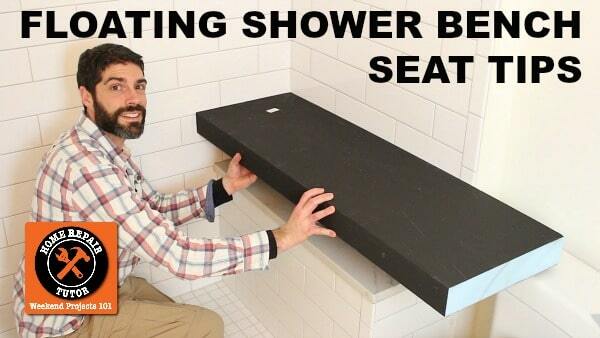 Would rather have the traditional shower bench….more stability! I would not trust a floating shower bench! Thanks Linda for your thoughts. Stability comes from the brackets being secured to wood blocking. So the bench would be very stable. Like I said to Bill, we’ll have a tutorial down the road showing how to properly install this bench. And I think that’ll make it apparent how stable it can be. Floating Bench, as I advance in age, I sure wouldn’t want to get down in a small shower to clean under anything? Looks cool, for you younger DYI’ers.